True but when a white coach begins making racist comments, I get worried ‘…its African mentality of not taking things serious,” lamented an angry Kerr.’ Does he really have to go the ‘African’ highway as opposed to ‘footballers’ in general? Joachim defended well and has a height advantage over Joash.Guikan and Lukewarm missed glorious chances and Gor might have scored two clear goals.Bonny was rarely called to action thanks to industrious midfielders and defenders although momany almost gave tusker a free goal.Live to fight another day as the unbeaten continues. AS widely predicted last week, Glad Kerr is toying with all tactical rotations and today he displayed 3-5-2 similar in sytle to the game against Zoo Kericho but with some variation ….Luokwam playing behind the main striker Guikan with shakava, joachim and momanyi the back 3 , wafula and blackberry plying up and down both wings and cassidy, mieno and juma roaming the midfield. Did it work ? Not really but we can do better if we perfect it before esperance. Guikan missed a sitter, Luokwam still has a lot to learn and cassidy and juma are still a bit game shy ! Good to see the tall back three all taking centre forward positions during corners/set pieces with cassidy , juma and mieno falling back to defend. Excellent from Kerr . My take is that as we approach next week’s do or die Game, we still want to see more of 3-5-2 in training because that could be the game changer against esperance who are tactically astute. All though many may blame Guikan for the shocking misses yesterday, I think given play time, the guy is gona be a leathal striker. His positioning is comparable to Drogba or Surez…attackers who are always at right place at the right time to finish off a move. He is currently being let down by his finish…..and is a little unfit. Hope the coach won’t give up on him. The outcome was acceptable considering we did not field our strongest side and we were playing a team that we can consider as rivals for the title,though they haven’t hit the gears yet. However,I was impressed by how the backline played as well as Lawrence Juma who for me was one of the best players on the pitch. Well done and all the best against Bandari and Esperance! 1) Hiting the upright is not the same blasting the ball wide aka rugby conversion, but it is simply bad luck. 2) What’s KPL upto, 3 tough matches is not only tiring out GMFC players but obviously Esperance are having a field due spying on us. Studying every tactic and analyzing each and every player. We already beat K.Sharks striaght from a tiring continental assignment. Surely the game against Bandari is now pure malice designed to give maximum advantage to Esperance, YAWA CAN’T EC COMPLAIN, FKF please show even an iota of patriotism, GMFC’s success is a plus for Kenya’s football. 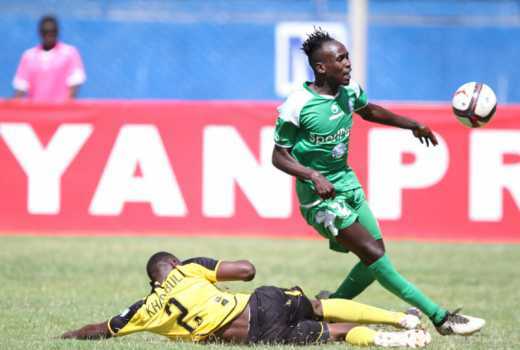 Don’t be blinded by petty jealousy and postpone the Bandari match as it will severely disadvantage GMFC against Esperance. Correction “…. having a field day…. Uganda Premier League January 2018, MVP is none other than Dan “Flava” Ssrenkuma. Congrats and all the best, I keep having this dream of you donning the K’Ogalo jersey again, banging in goals and collecting another top scorer’s medal.